Looking to test your 12-weight rod? Want to check out the acoustics of your new reel? Head to Jupiter for false albacore. False Albacore are more accurately called little tunny (latin name: Euthynnus alletteratus). They are often referred to as bonito, but albies are not the same fish as the true Atlantic or Pacific bonito. These fish range all over warm-to-temperate oceans, which for you as an angler, means that they are in found in places that are fun to fish. There distribution is widespread and availability is not really dependent on any particular season. Two of the prime spots to fish for them are off Harkers Island, North Carolina, and off the east coast of Florida. The False Albacore diet is pretty simple, Albies eat smaller fish. This clues you in to your angling strategy and makes fly selection very easy, Baitfish imitators. Bring some white Deceivers, some olive-backed Sea Habits, some of Capt. Scott Hamilton’s “Eat Me’s”which is somewhat of a cross between a Sea Habit and a synthetic Deceiver, and you should be set. The key to catching these fish is finding them. False Albacore like structure and loiter where stucture and smaller fish that use the structure to shelter them from preying species. They normally dwell above reefs and wrecks in anywhere from 30-100 feet of water but can be found in open waters on sea shelfs and drop offs. Most of our fishing for them has been in Florida, an it has always involved live chum. You or your captain can throw out a very small handful of baitfish, and then there’s the mesmerizing spectacle of these fish appearing from like 60 feet down to eat whatever goes overboard. They come en masse, they’re aggressive, and they’re about as much fun as fly fishing offers. Just watching them materialize is as much fun as catching them….Almost. As for gear, these are not objectively big fish, but they are tunas. A really big albie would run around 15 pounds. Most are more like 6-10 pounds. You might think that it’s overkill to use a 12-weight on such small fish – after all, that’s the same stick you’d use on 150-pound tarpon. But these fish are tough. They don’t jump, and generally they don’t streak across the surface. They just head away from you, and then drive down, and they do it fast. I have no accurate idea of how fast these fish swim (estimates vary wildly), but if you tied your line to your friend’s moped and then had him drive off as fast as possible you’d get a sense of albies’ speed. The 12-weight helps tremendously in bringing the fish up from the depths, and it will help you get the fish to the boat fast. Then you can do the torpedo-style release, mastered by Capt. Scott Hamilton, as follows: tail the fish; bring it aboard, remove the hook, and then fire it back into the water head-first. The fish invariably rockets away. Then get your fly out there and do the whole thing again. You do not, of course, need a 12-weight for these guys. A 10 weight is pretty much standard. And sometimes you’ll find nothing but 4 pounders (~1-2 kg), in which case it’s nice to have an 8 weight handy. Some further notes: Use fluorocarbon tippets. Albies are generally found in clear water, and they have exceptional eyesight. Something around 15-pound test should do the trick. Also, albies have small cone-shaped teeth, so a short shock tippet – say 8 inches of 40-pound fluoro – is a good idea. An intermediate line is perfect here. Sometimes you can get albies on poppers, in which case a floating line works fine. But an Intermediate lines will also work with the topwaters, and it casts much better than a floating line. These fish are tough, plentiful, and super fun. 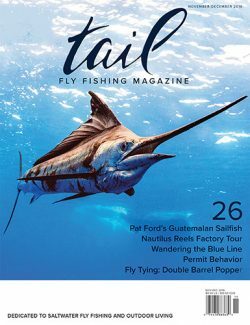 We’ve been on many trips for more glamorous fish like Sailfish, Marlin and Dorado where the targeted species has been scarce. Many times on these trips albies have saved the day. And many times we’ve booked trips to Florida just to fish for these amazing fish.